All routes are carefully mapped by our organizing team of cyclists using their local knowledge and experience. This year we have a new 10 km in town family friendly route being offered. Each route is guaranteed to provide the perfect blend of challenge and scenery, with fuel and water stations along the way. Take a look at what Cycle Camelot 2019 has to offer. Ideal for experienced road cyclists, this route will feature challenging climbs, stunning rural landscape views and a well-earned rest stop. The Silver Route features a mixture of rolling rural countryside, some challenging climbs, combined with superb vistas along with a rest stop to recharge yourself. 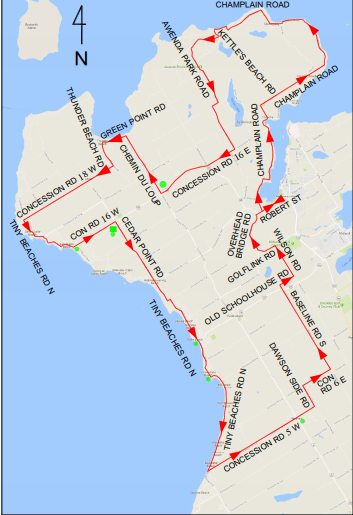 Starting at the Penetanguishene waterfront, the Bronze Route will take you over 11 of the 14 historic bridges on this trail, each with a small piece of history. 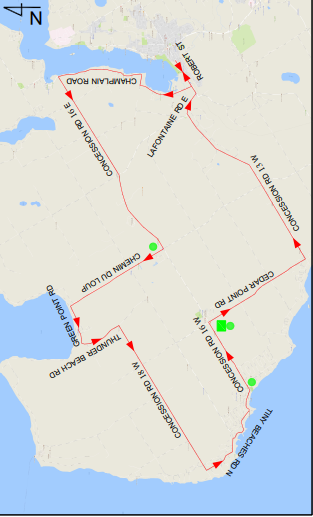 This is a great route for someone who is comfortable on a bike and not quite comfortable enough to ride on the road. The Family Friendly Route is an opportunity for casual cyclists and families to experience the local scenery in the town of Penetanguishene on a nice ride out to Discovery Harbour and back. Enjoy the companionship of fellow riders while taking numerous rest stops along route. All ages are welcome!